By clv4@duke.edu in OIT on November 14, 2013 . Interested in setting up a custom workflow in SharePoint but don’t know where to begin? Check out this lynda.com online training tutorial to help you understand workflows and walk you through what you need to know. 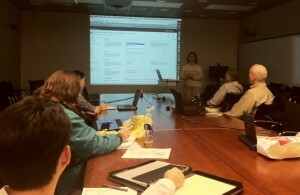 Debrah Suggs, OIT shows off her mad SharePoint skills at a recent Learn IT @ Lunch session!